The Redwood JB2 Bass Guitar with Natural finish is a fantastic bass that doesn't just look pretty awesome, but plays like a dream and produces some incredibly lush tones. Beginners and advanced players alike will appreciate the comfortability and versatility offered by this superb model, and once you start playing, you'll struggle to stop. The Redwood JB2 is constructed with a unique offset-waist profile, and features a solid alder body, Canadian hard maple neck and fingerboard, and 2 tone-laden single-coil pickups. All brought together, the Redwood JB2 evokes a classic vibe with modern sensibilities, in a high quality and very affordable instrument. The Redwood JB2 is constructed from a lightweight alder tonewood, providing a healthy blend of high, mid and low frequencies to give you a broad tonal arsenal to play with. Alder is notably a great "all-rounder" tonewood, which can easily adapt to any particular style and makes it great for players who perform a diverse repertoire of musical styles. The Redwood JB2 is shaped to an offset-waist profile, making it very comfortable to play in both a seated or standing position. The natural grain of the alder is proudly displayed for all to see, which is complemented by a 3-ply black pickguard and chrome control panel. Bolted onto the body of the Redwood JB-50 J Style Bass is a hard maple neck, which is both durable and comfortable. The neck profile is slender enough to navigate easily, whilst retaining a substantial feel for added reassurance. Thanks to the gloss finish, you can glide along with expert precision. Married to the neck is a matching Canadian hard maple fingerboard, which is home to 20-frets that are adorned with black block position inlays. The maple/maple partnership infuses each note with a sparkling clarity, which provides a subtle edge to the softer alder. The Redwood JB2 is equipped with two single-coil pickups, which work perfectly with the alder body to generate a wide range of tones that are suited to blues, jazz. rock 'n' roll, hard rock - you get the idea. Each pickup is controlled with a volume control knob, so you can create your own blend of each pickup for an overall tone. There is a master tone knob that controls the overall output, allowing you to tweak the sound to your liking. The headstock is fitted with open-style tuning machines in a four-in-line arrangement, offering easy adjustment over each string whilst upholding tuning integrity with precision. Nut provides a firm seat for each string to uphold string placement and tension, working dutifully in partnership with the tuning machines. Fitted to the body is a vintage-style bridge, which provides a seamless connection between the strings and body. Posted on 11/03/2019 by John L A really great bass, with a vintage vibe,well made,great sound,a bargain all round,if it were double the price it would still be a great buy,get one before they go ! Posted on 06/02/2019 by martin this bass would still be a bargain if it was at twice the price. thank you dawsons. Posted on 24/06/2018 by Nick I'm a lead guitar player who just fancied a cheap bass for a bit of fun. I liked the look of this and thought yeah, that'll do. However, for £130 what a cracker !! it's well made, solid wood and quite a pleasure to play. It's not a £1000 guitar but it's well worth every penny of it's price. Posted on 06/01/2018 by Frankie As soon as I saw it on Amazon I knew I had to have it. And I wasn't disappointed. Looks beautiful, plays beautifully, sounds smooth. Best Jazz bass, genuine Fender or copy, I've ever played, for the best price ever. Posted on 11/12/2017 by Jimbo Arrived promptly,well packaged, fantastic quality,super shine , gorgeous looking beast......oh, almost forgot,sounds great as well. Bargain. 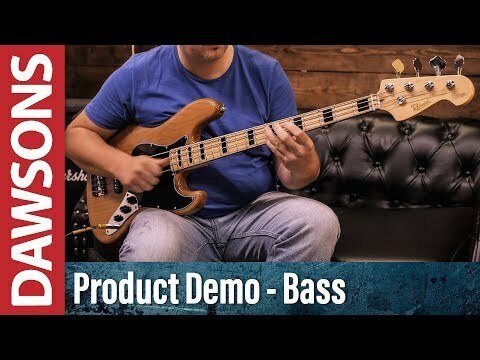 Posted on 13/09/2017 by Groovehack I tried one out last week against an actual Fender jass bass, and to be quite honest you could bearly tell the difference except in the over all tone. The build quality is excellent, and for one hundred and fifty pounds you can't go wrong.